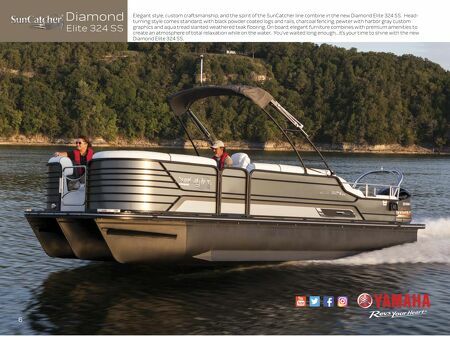 In the bow, plush furniture, a pedestal table and under-deck storage for skis and water toys means the Diamond Elite 324 SS is ready for entertaining and fast-paced fun at a moment's notice. Re Diamond Elite has classic styling, topped off with a black powder coated tower with charcoal tweed Sunbrella® canvas. Stern lounge area has two gracefully styled lay-down couches with storage, cup holders and small amenity compartment all within reach. 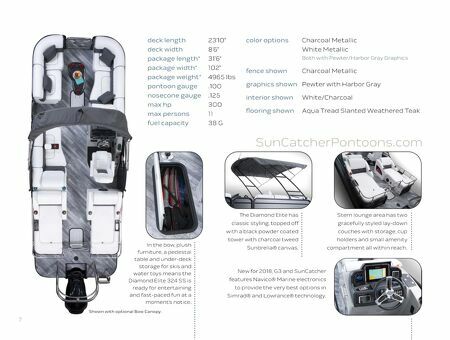 7 deck length 23'10" deck width 8'6" package length* 31'6" package width* 102" package weight* 4965 lbs pontoon gauge .100 nosecone gauge .125 max hp 300 max persons 11 fuel capacity 38 G SunCatcherPontoons.com New for 2018, G3 and SunCatcher features Navico® Marine electronics to provide the very best options in Simrad® and Lowrance® technology. color options Charcoal Metallic White Metallic Both with Pewter/Harbor Gray Graphics fence shown Charcoal Metallic graphics shown Pewter with Harbor Gray interior shown White/Charcoal flooring shown Aqua Tread Slanted Weathered Teak Shown with optional Bow Canopy.